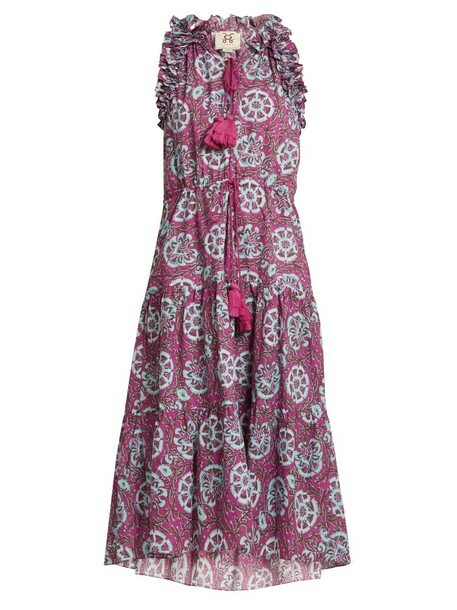 Figue's fuchsia-purple cotton Gabriella dress will conjure free-spirited vibes on your next vacation. Handmade in India it features a statement floral pattern in bold shades of pink and blue and is cut to a sleeveless silhouette that falls in voluminous tiers to swirl around the calves. Feminine ruffles and swinging tasselled ties enhance the bohemian feel. Team it with tan leather sandals for a relaxed holiday look.